Small businesses are the backbone of the US economy. They are the biggest job creators and offer a path to the American Dream. But for many, it is difficult to get the capital they need to operate and succeed. In the Great Recession, access to capital for small businesses froze, and in the aftermath, many community banks shuttered their doors and other lenders that had weathered the storm turned to more profitable avenues. For years after the financial crisis, the outlook for many small businesses was bleak. But then a new dawn of financial technology, or “fintech”, emerged. Beginning in 2010, new fintech entrepreneurs recognised the gaps in the small business lending market and revolutionized the customer experience for small business owners. Instead of Xeroxing a pile of paperwork and waiting weeks for an answer, small businesses filled out applications online and heard back within hours, sometimes even minutes. Banks scrambled to catch up. Technology companies like Amazon, PayPal, and Square entered the market, and new possibilities for even more transformative products and services began to appear. In “Fintech, Small Business & the American Dream: How Technology Is Transforming Lending and Shaping a New Era of Small Business Opportunity”, former US Small Business Administrator and Senior Fellow at Harvard Business School, Karen G. Mills, focuses on the needs of small businesses for capital and how technology will transform the small business lending market. This is a market that has been plagued by frictions: it is hard for a lender to figure out which small businesses are creditworthy, and borrowers often don’t know how much money or what kind of loan they need. New streams of data have the power to illuminate the opaque nature of a small business’s finances, making it easier for them to weather bumpy cash flows and providing more transparency to potential lenders. Mills charts how fintech has changed and will continue to change small business lending, and how financial innovation and wise regulation can restore a path to the American Dream. 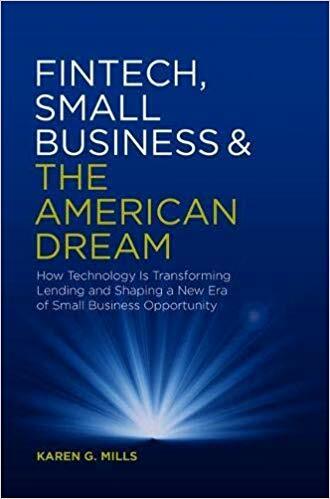 An ambitious book grappling with the broad significance of small business to the economy, the historical role of credit markets, the dynamics of innovation cycles, and the policy implications for regulation, “Fintech, Small Business & the American Dream” is relevant to bankers, fintech investors, and regulators; in fact, to anyone who is interested in the future of small business in America.